Normally, a person might think of their antique bathroom vanity as merely a means to store toiletries and cleaning products, and add some rustic or classic ambiance to their bathroom. But ABC News reported on an incident in which a bathroom vanity played a part in solving a four decade-long mystery with particular importance to a couple who has been married for 45 years. "I was debating on whether or not to redo the bathroom because it's probably original with the house, but I thought I should go ahead," 63-year-old Rita Hellmich of Greensburg, Ind., who had only occupied the abode for 10 years, explained to the news provider. "One of the contractors took the existing vanity out. Literally, the ring popped out. It was that tight behind the vanity. It even made an indention on the plaster. It was in there that tight." She continued to say that the contractor, at first, assumed it was her ring. But she immediately noticed the engraved initials and wedding date, and rightly deduced that this ring belonged to a previous denizen of the home. Through doing a little bit of detective work, she contacted Paul and Joyce Warner, who just-so-happened to preparing to celebrate their 45th anniversary. Within days, the couple drove over to pick the ring up. Joyce Werner described her reaction to the news that her wedding ring had finally been unearthed after 40 years as "speechless" to ABC News. While the odds of finding someone else's heirloom while remodeling a bathroom are, to say the least, less than terrific, HomeThangs recently pointed to other reasons why people may want to think about refurbishing their bathroom decor with an antique vanity. The source explains that modern bathroom decor has become quite fashionable in recent times, but those who prefer an "ornate" and "traditional" appearance in their bathroom have plenty of options. Pictures of old school bathroom vanities abound on Houzz.com, including one with a brown and grey marble counter top, dresser drawers that appear to be from the Victorian era and brass-colored sink faucets that could even be said to have a "steam punk" aspect to their look. 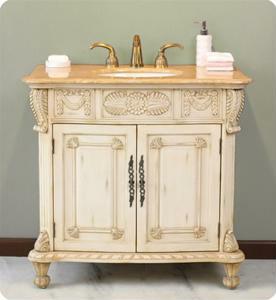 It's also possible for a vanity to have an antique look with a modern sensibility. For example, down the page there's a picture of a wooden vanity with an oval shape, with shelves and drawers arranged in an innovative manner.